So it's been a while since I blogged. Bit slack - that's life though right? I'm jumping back in with a link up to Sugar and Spice for Wordless Wednesday. My kids are ten year olds, and they still amaze me with their creativity. Here we have them creating "Space Bear" and practicing their CPR skills on our class teddy. WHAT FUNNY THINGS DO YOUR KIDS DO BEFORE SCHOOL THAT MAKE YOU SMILE? Right now I'm sitting on my bed watching old school Grey's Anatomy episodes, while dying my hair. There's been an outbreak of nits in my class, and I've heard that hair dye can help kill the little creepy crawlies! Plus, my hair was well in the need for it too! Not sure if I succumbed to the nastiness, but y'all know the horrible sympathetic scratchiness you get when you even hear the word! I'll even bet you're reaching up to your head right now! Right, the real reason I'm stopping by is to put in my Weekend Windback post! I'd totally love for you to link up! All you need to do is dump your camera and create a post. Simple right?! Totally. I'm totally going to bribe you to link up to - with free stuff! Who doesn't love free stuff? Everyone who links up will go in the draw to win 3 products from my TPT store. If there are more than 10 people, then I will draw two winners. RIGHT! On to the actual photos!! The lovely Mrs Brinn from Learning with Mrs Brinn sent me this awesome book and necklace as part of the SLANT box exchange. Check out Lessons with Coffee to see what everyone else sent. I also made this guy. He's pretty darn cute! Book clubs are going pretty well! I love how independent my kids are with this. They are driving their learning! We LOVE LOVE LOVE go noodle!! Have you started gonoodling yet? Our internet is pretty terrible in my class, so we have to be really patient waiting for the videos to load up. Sometimes they don't, but the ones that do are pretty awesome. I taught my kids how to make pikelets. Mixed results! Right it's your turn!! Get your link on, and I'll catch you on the flip side!! Seriously, someone please explain it to me, because I'm about ready to lose my rag!! Ok let me set the scene. In my class I have 28 (soon to be 29) students. All of these students (bar one) are below the New Zealand national expectation in reading, writing, and numeracy. The range for these kids goes from 5 years below to within 2 months of the expectation. 6 of my students are ESOL funded, but most of them speak a language other than English at home. The student who is 5 years below has special learning needs funding, and gets 30 minutes, twice a day, with a teacher aide/outside support. Oh and did I mention that I STILL don't have an IEP for that student? I'm still waiting for our SENCO (Special Education Needs Co-ordinator) to get back to me on when that meeting is going to happen. Oh and we are now 4 months into the school year. In her defence though, she's new to the role as of last week. Right so here is my problem! This term my team leader and I have started co-teaching reading and writing in our middle block. We have sorted the kids into cooperative, vertically streamed reading groups (I'll write another post on that another day, but the reading groups have about 6 kids with varying reading ages). Okay, so in his class, are another two kids with high learning needs. Both are about the same learning level as my kid. All three have individual plans from an outside agency, all three have teacher aide time. We grouped those three together. Developed a plan that included all the same types of activities the rest of the class was working on, just at their level. These kids worked with the teacher aide to read their book, answer the questions, talk about their learning, and do some writing. Same deal as the rest of the kids. I was told today that this was NOT inclusive education. Instead I have to separate these kids, put them into a group where I know they will not cope, and let them go one at a time for 1-1 instruction. Call me crazy, but I REALLY think that the social interactions and discussions these kids have together for 1.5 hours FAR outway the 30 minutes of 1-1 learning and then 1 hour of struggling I'm forced into giving them. PLEASE let me know what I'm missing!! Welcome to another edition of The Weekend Windback! Where you share the week that was in picture form. Here are my pictures. Feel free to link up, and then go and comment on the other people who link up below! First thing back and I made my kids sit a test. Followed by another two tests. The crazies loved it!! And even begged me for another one! Give kids a box and they will be creative!! I left the room for 5 minutes and came back to this! Kids are awesome. They called him "Space bear"
I got busy creating. You can find the following two items in my TPT store now. Back to school means back to work. Lots of laminating needed doing before book clubs started up again! This hoodie came from teespring on Friday. I love it. It's all me. Perfection!! Right it's your turn!! Link up, share your photos, and get ready for a new week!! 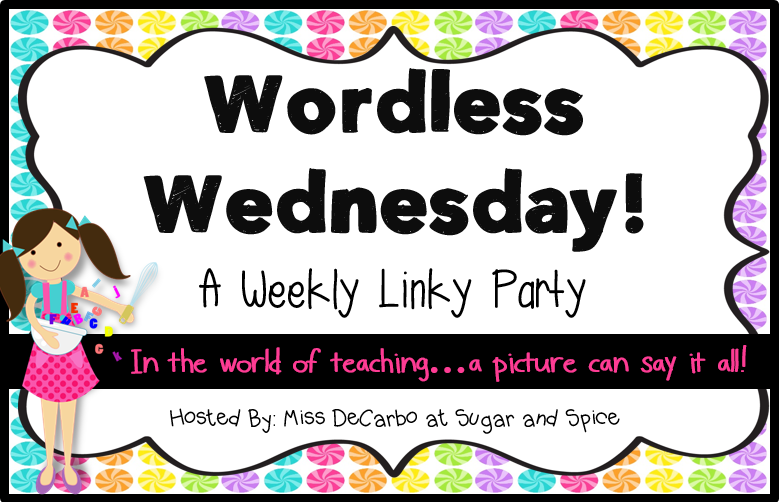 I'm going to be linking up again with Sugar and Spice for her Wordless Wednesday linky! I love it - so easy, so little to think about! On Monday, Wednesday, and Friday I go to bootcamp at 6am. So I have eggs on toast for breakfast when I get back. On Tuesday and Thursday I roll out of bed at 730 and if I'm lucky will grab some fruit on my way out the door. I really need to find something to have on those days!! My Question - What do you have for breakfast before school? Really the ONLY thing starwarsy about this post is the date. I'm not a fan, it's just that I was just watching The Big Bang Theory, and I'm up way too late on Saturday night! SOOOO welcome back to the Weekend Windback!! This is a chance for you to purge your camera, and dump all your photos in time for the new week. Tell us as much, or as little as you'd like! The aim is to get to know some of your fellow bloggers, and see what they have been up to this week. School starts back for term 2 tomorrow. Back into the swing of things! I spent the last two nights at an AMAZING church conference. Ps Chris Hill from Denver in America totally knocked it out of the park with his messages!! On Friday I saw both the sunrise (at bootcamp) and then the sunset (shown here) while on a walk with a friend. Had a PD day on the last day of the holidays. While I TOTALLY wasn't looking forward to it, it was actually really good. TOTAL geek out moment this week when I sold my FIRST product on TPT. Such an awesome feeling!! I've been riding that high all week. And a funny to finish the week. Right it's your turn now!! Share those photos. They don't have to be school related (mine weren't this week!) You don't even have to tell us anything about them. Just link on up! Wow! I've just got back from a Church conference this evening and BOY was it pumping!! I'm heading over to Farley's blog now to link up with the MAY CURRENTLY! ps that is some cray cray stuff, I can't believe it's MAY!!! Loving - I started the day at 530 this morning with Boot Camp. Totally loved it, and loving the sore muscles I have now!! Wanting - I'm totally content right now, and there is absolutely nothing I want! Needing - On the other hand, I really should write this in the morning and go to sleep... Nearly done push through!! Surprize - Well there are a million wonderful bloggers out there that I could surprise, but I'm going to go with the awesome Erin (I mostly chose her because of her cool name) over at Miss Lifesaver. I love reading her posts, because there is always a good mix of humour, teacher posts, and resources. She's awesome, go check her out!! Then head over to the rest of the Currently linkups!! Weekend wind back - With some prizes! !